I was blessed to receive a copy of Putting on the Spirit - Ten Minute Devotions for Busy Moms by Katie Hornor! This devotional book has been such a blessing to me! 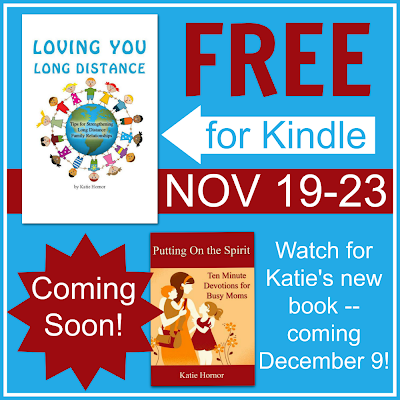 It has helped me understand the fruit of the Spirit better, and learn how I can help the fruit of the Spirit grow in my own life, even with all the crazy busyness of being a mom. 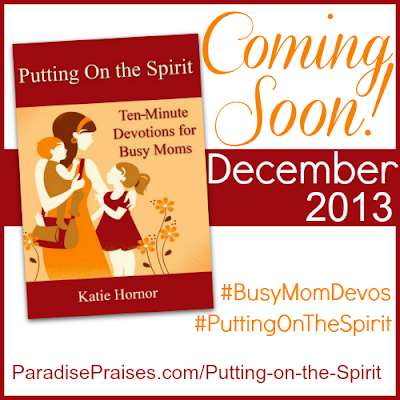 I am looking forward to telling you more about it in another post when the book is released on December 9 :) For now, let me just tell you that if you are a busy, Christian mom (and aren't ALL moms busy moms?) this book will bless you too! "We are a missionary, home educating, hospitality loving family doing our best to glorify God as we live, work and minister in tropical Mexico (You can visit our family website here.)" Marcy from the Ben & Me blog is our launch team coordinator, and she organized this awesome give away for me to share with you! 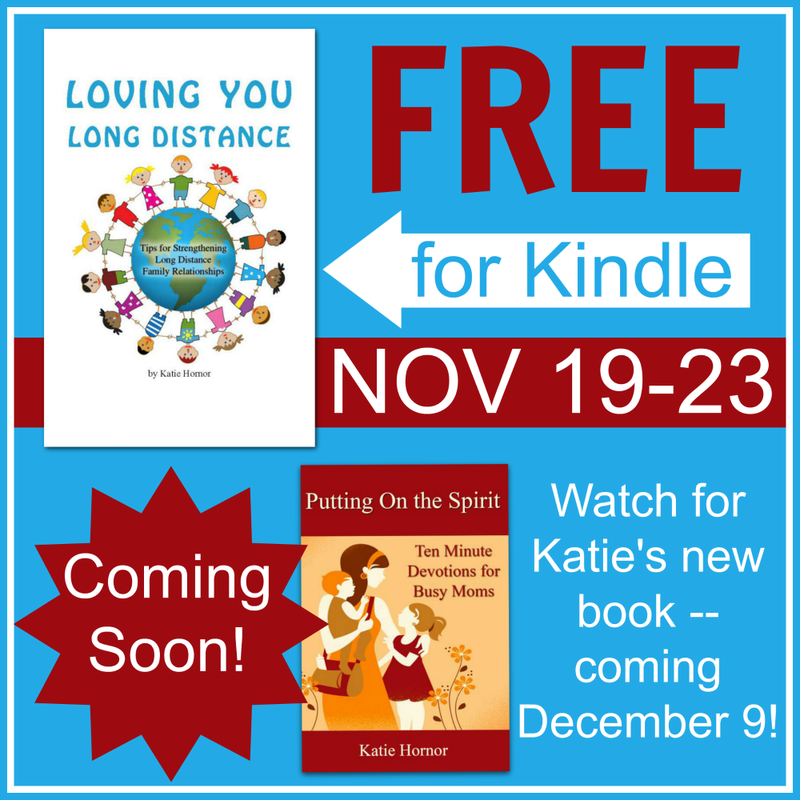 In addition to this great giveaway, Katie is offering her book, Loving You Long Distance, free for Kindle for 5 days -- November 19-23. 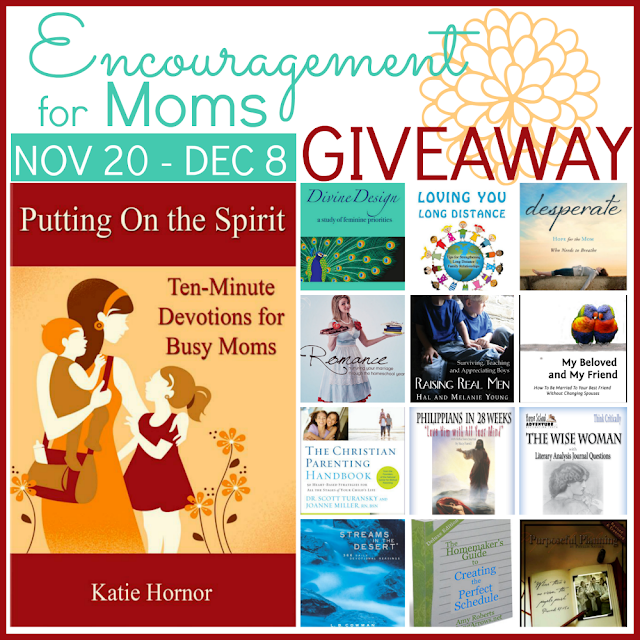 Be sure to click over and grab that one after you enter the giveaway! i find nothing more encouraging and uplifting than one of the kids crawling into my lap and cuddling. That is without a doubt one of the best rewards of being a mom! Thank you for taking the time to stop by and leave a comment Pamela! It really is, Annette :) I can hardly wait to share it with you when the book is released! Moms are so busy pouring into the lives of their families. It's great to spend some time pulled apart with God to help us to gain the inward strength to do what is required each day! Thank you for stopping by and taking the time to comment Susan! Thanks for stopping by and taking the time to leave a comment Jenn! That would be encouraging! I don't think I know anyone that I grew up with that homeschools. 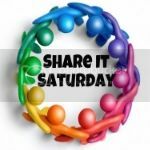 I've met people that my husband grew up with that were homeschooled and are homeschooling their own children. I find that very encouraging too! My time with family is what keeps me going! Knowing that I am doing my job, as long as there is always at least a little free time to just enjoy our family. That's great, Dakota! Thank you for taking the time to leave a comment! I think that both my mom and mother-in-law would agree with you Amy ;) Thanks for stopping by and taking the time to comment! I feel encouraged by certain experiences with my kids. Anything that I find myself stopping to "drink in" the moment, whether it's when someone climbs up on the couch for a calming cuddle or when they are running around WILD with creative (and noisy) play or when they open their hearts to me and share some of their dreams/hopes/fears/etc. with me "just becase" ... I love those times that build precious memories!